A year ago, the future looked grim for the Montreal Canadiens. Coming off one of their worst seasons in history, they finished with a record of 29-40-13 for 76 points and sat near the bottom of the Eastern Conference standings. Fans and pundits were calling for general manager Marc Bergevin to be fired. His offseason moves – selecting Finnish center Jesperi Kotkaniemi with the third overall pick in the 2018 draft, shipping Alex Galchenyuk to Arizona for winger Max Domi, dealing captain Max Pacioretty to Las Vegas before training camp for winger Tomas Tatar, prospect Nick Suzuki, and a 2019 second-round pick – only stoked criticism of his management skills. Canadiens owner Geoff Molson was wise to ignore the demands of the Habs faithful. Kotkaniemi had a respectable 34-point NHL debut. Domi and Tatar provided a welcome boost of offense and positive energy. Suzuki is tearing it up on the OHL and looks like a future NHL star. 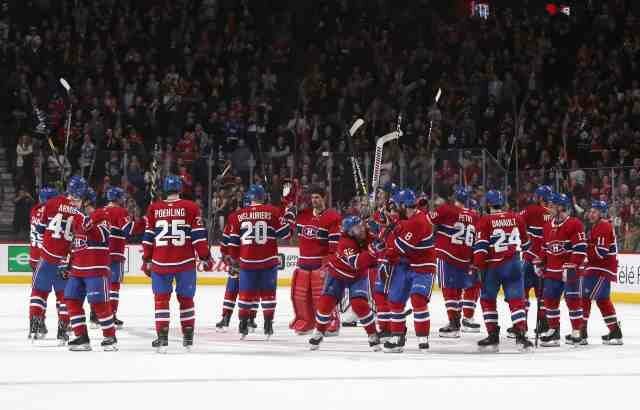 Best of all, the Canadiens finished with a record of 44-30-8 for 96 points. While they missed the playoffs again, they were in contention up to the final weekend of the season. Suddenly, the future appears much brighter. Bergevin cannot rest on his laurels this summer. Despite the Canadiens improvement they still missed the playoffs. Roster weaknesses remain that must be addressed this summer. While the Canadiens offensive production rose to 14th overall (3.00 goals for per game), their powerplay percentage (13.2) ranked 30th. That inability to cash in with the man advantage contributed to their inability to hang onto a playoff spot. Starting goaltender Carey Price was his usual outstanding self in 2018-19. However, backup Antti Niemi had a horrible season and won’t be back. Bergevin must find someone who can ensure Price doesn’t become overworked. The Canadiens also lack an experienced left-side defenseman. Not only did that also contribute to their lousy power-play numbers, but it also left captain Shea Weber without a solid defense partner on the top pairing. Despite the improvement in their offensive numbers this season, the Canadiens could use another top-six forward. Some of these issues could be addressed from within. Goalie Charlie Lindgren has some NHL experience under his belt and could be ready to become Price’s understudy. The emergence of Kotkaniemi plus promising youngsters within their system like Suzuki and Ryan Poehling could provide that much-needed boost to their scoring punch. As per Cap Friendly, the Canadiens have over $65 million invested in 17 players with all their core talent under contract for 2019-20. That leaves Bergevin with around $18 million to work with should the salary cap reach $83 million as projected. That’s plenty of money to bring in an established talent or two. Going the free-agent route won’t be easy. The Montreal Gazette’s Pat Hickey points out issues such as taxes, weather, language, and travel can work against the Canadiens efforts to entice UFA talent to Montreal. He doesn’t expect Bergevin will have much success luring any top-tier free agents. That doesn’t mean Bergevin won’t make any UFA signings this summer. However, they’ll likely be at best affordable second-tier players. Hickey also noted Bergevin isn’t keen on targeting rival teams’ top restricted free agents with offer sheets. Don’t expect to see Calgary’s Matthew Tkachuk, Tampa Bay’s Brayden Point, or Toronto’s Mitch Marner in a Habs jersey next season. Bergevin will likely do what he did last summer and turn to the trade market. He’s unwilling to part with his first-round picks or top prospects like Poehling or Suzuki. However, he does have two second-round picks and three fifth-rounders in this year’s draft plus two third-rounders in the 2020 draft to draw upon for trade bait. The Canadiens GM could also target cap-strapped teams looking to shed salary this summer. The Edmonton Oilers, Los Angeles Kings, Pittsburgh Penguins, Tampa Bay Lightning, Toronto Maple Leafs and Winnipeg Jets could be among those looking to move quality players to free up cap space for other moves or signings. Bergevin won’t look at taking on aging, expensive veterans, so forget about the Oilers sending him Milan Lucic or the Kings trying to sell him on Ilya Kovalchuk. He’ll want players with speed and skill still young enough to have a positive impact now and for the future. In other words, perhaps someone like Oilers defenseman Darnell Nurse or Kings winger Tyler Toffoli. The Canadiens improvement this season bodes well for the future, but Bergevin knows he must address their problem areas. He acknowledged Molson has given him permission to spend to the cap if needed. Expect him to use it to his club’s advantage this summer.